Ocean themes for coloring fun. Kids can color their own canvas bag, then head to the beach! 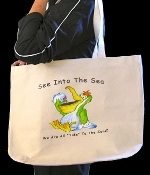 Each bag has tide pool rules on the back so kids learn how to protect the tide pools. Crayons included.